For weeks I struggled to write this post. 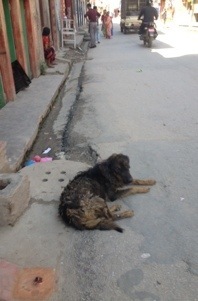 Then my Nepali host-father struck a street dog with his walking stick. The dog was foraging in litter bags, its back turned; this is how they live. The blow was a short, powerful one. The stick clattered, the dog yelped, skittered, spun, teeth bared. My host-father laughed deeply and someone behind him joined in. ‘Na ram ro,’ I shook my head. Not good, my painfully inadequate way of expressing my disgust in his language. ‘Dirty,’ he said, in mine. Dirty, polluted and over populated. The Bagmati and Bisumati rivers are brimming with waste; agricultural, industrial, human. The streets are thick with dust, putrid emissions – even the rain brings down dirt – and litter, scattered at will, heaped in bags, perversely attractive in its varied colours and textures. When you walk the streets and hear a low throaty rumble behind you, you might mistake it for a growl. But it is more likely a Nepali, summoning the crud from their lungs before hocking that onto the street to join the rest of the filth. Living among the pollution and the people are the street-dogs. Thousands and thousands of them. By day they slumber in doorways or on stoops, one eye open for feeding opportunities. By night, dog communities rule. Silence in Kathmandu is rare, even in the early hours. Instead the night is rent with dog politics – howls, barks, squeals and chatters. They live and die among human droppings and garbage with little human intervention, let alone kindness. Most are thin. 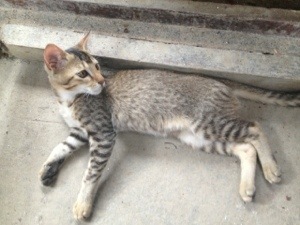 Many have mange and other parasites. Many bear wounds from cars, battle or burns. And when there are too many, when the population becomes too much, the community resolves this through a cull. 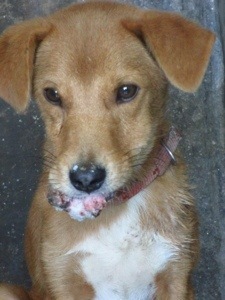 In acts of utter cowardice they poison the dogs. Man and dog in Kathmandu? Dependence and ignorance. Unlike the arrogant monkeys that swing in parks and around temples, the dogs rely on people. Yet the people are ignorant, even cruel. 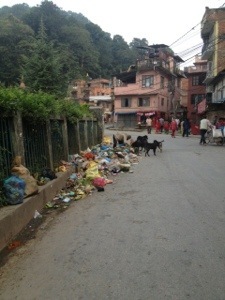 Striking a dog will not stop it foraging in the rubbish, nor will it cleanse the streets and the habits of Kathmandu. 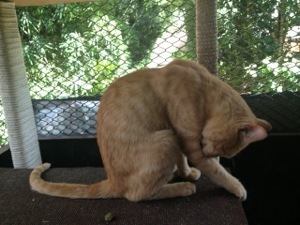 I arrive at Kathmandu Animal Treatment Centre (KAT) (ironic because most of their treatment is administered to dogs). 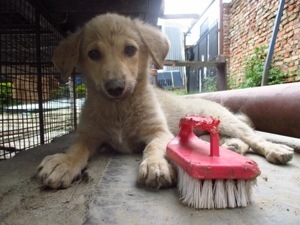 Set up in 2003 by Jan Salter, an artist based in Kathmandu, the charity have implemented a neutering scheme, spaying those female street dogs they can catch, area by area; they treat the injured or diseased (dogs and the occasional cat) and are working to make Kathmandu a rabies-free city. Now, KAT are moving to newer, bigger premises, as their current one bursts with a frightening (for me) abundance of canine life. So, here’s the outstretched hand. I would like to help KAT. Their cause is in my face and under my feet daily. And in my ears nightly. Nepal has so many pressing problems – political instability, depleted water resources, poverty, discrimination – this one is low down on the national conscience. But somebody has to do something and KAT – helped by their volunteers and funded by donations – are, despite the uphill struggle. I have set up a Just Giving page and will be using my own uphill struggle – an 18 day trek through the Annapurnas, beginning 3 October – to raise money. I am doing the trek anyway but it seems like a request for donations must be accompanied by a courageous, endurance or crazy event. In the interest of clarity, this is endurance event; I have named it Animal-purna (sorry). 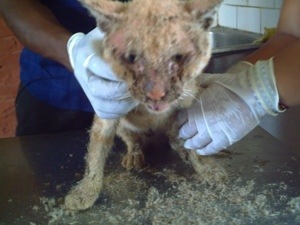 So, please visit KAT’s website and my Just Giving page if you have the time and money to spare.